What Else Can I Expect From an Online Bachelor's in Hospitality Management Program? Hospitality management is an academic field that explores operational and administrative strategies for hotels, lodges, restaurants, country clubs, amusement parks, and other tourist-friendly establishments. Like other areas of management, hospitality managers work to reduce costs, maximize profits, and create sustainable business plans. Students who major in hospitality management also learn how to accommodate a range of clients and create a positive experience for guests. Potential concentration areas include logistics, supply chain management, marketing, communications, and leadership. Although most occupations in the hospitality industry do not require a formal education, business and management positions in the field often require a bachelor's degree. Today, many students who are interested in hospitality management are choosing to earn their degree online, rather than in a classroom. The flexible, web-based format is particularly convenient for students who must balance their coursework with other responsibilities, such childcare or a part-time job. Read on to learn more about what you will learn in a hospitality management program, and what kind of career opportunities you can look forward to once you have your degree. With a hospitality management degree, you can help with the operation and administration of hotels, restaurants, lodges, country clubs, and other tourist-friendly destinations. Read more here..
A hospitality management degree teaches students how to operate businesses that accommodate the needs of a wide variety of guests and clients. Read more here..
IS A DEGREE IN HOSPITALITY MANAGEMENT WORTH IT? Yes. While salaries depend largely on experience, entry-level professionals with a bachelor's in hospitality management outearned associate-holders by around 25% at entry-level and mid-career stages. Read more here..
WHAT DOES HOSPITALITY MANAGEMENT MEAN? Hospitality management refers to the operation and administration of businesses -- such as hotels, restaurants, and casinos -- that cater to the needs of guests and clients. Read more here..
WHY SHOULD I STUDY HOSPITALITY MANAGEMENT? You should study hospitality management if you are interested in interacting with guests and clients, and if you want to learn about fundamental principles -- such as budgeting, event planning, and marketing -- that help businesses succeed. Read more here..
WILL AN ONLINE BACHELOR'S IN HOSPITALITY MANAGEMENT PROGRAM PROVIDE ME WITH THE SKILLS I NEED TO ADVANCE MY CAREER? Online programs in hospitality management cover the fundamentals of business finance and guest services. Working in hospitality can also be hectic at times, and students are taught how to solve problems quickly in high-pressure situations. Hospitality management majors can also pursue an internship, where they receive supervised training from established professionals. WILL AN ONLINE BACHELOR'S IN HOSPITALITY MANAGEMENT WORK WITH MY SCHEDULE? Online bachelor's in hospitality management programs offer a convenient alternative to traditional brick-and-mortar education. Most programs are taught asynchronously, which allows students to access course materials, submit written assignments, and take exams on their own schedule. Current e-learning technology also allows them to study away from their home computer using a laptop, tablet, smartphone, or any other device with Wi-Fi capabilities. For additional convenience, most online programs allow students to arrange internships at sites near their current residence. WHAT JOBS CAN I GET WITH MY BACHELOR'S IN HOSPITALITY MANAGEMENT? Graduates with a bachelor's degree in hospitality management are eligible for supervisory roles in the industry, along with specialized occupations in event planning, guest assistance, catering, and caretaking. Additionally, many students jumpstart their job-search while still in school; since many hospitality chains strive to promote from within, students who work part-time in low-level positions (such as a front desk agent or a housekeeper) are often able to graduate with valuable industry experience. WHAT ARE THE BEST ONLINE BACHELOR'S IN HOSPITALITY MANAGEMENT PROGRAMS? Choosing a program is a very personal decision, and only you can properly evaluate whether a target school's strengths match your professional interests. The following ranked list of schools should serve as a helpful starting point in your search for the best online hospitality management programs in the United States. 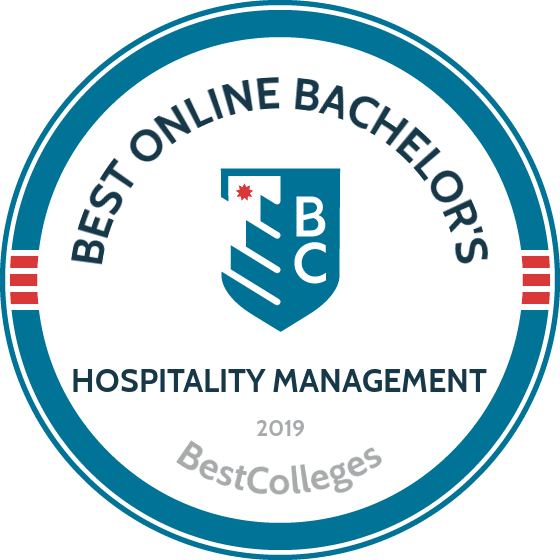 If you are considering going back to school for a bachelor's degree in hospitality management, and you value the flexibility inherent in the online format, be sure to take a look at these top colleges. Based in Miami, Florida International University delivers more than 40 remote undergraduate programs facilitated by the Canvas platform. Students in the online bachelor of science in hospitality management program gain fundamental business skills, including the ability to analyze organizational finance and manage logistics. They also learn to negotiate with vendors and implement hospitality marketing strategies. The 120-credit degree plan comprises perfunctory coursework in hospitality industry law, hospitality analytics and revenue management, and restaurant management. Students take advanced classes in one of six concentrations: beverage management, culinary management, event management, hotel/lodging management, restaurant/food service management, or travel and tourism management. The Chaplin School of Hospitality and Tourism Management requires degree candidates to complete a 300-hour internship. Students can participate in practicums in their area or engage with a university-coordinated event, including the prestigious South Beach Food and Wine Festival. Learners need at least 1,000 hours of relevant work experience to graduate. Students pursuing the hospitality management degree online complete their training with a senior seminar. Working in groups, learners identify a major problem in their concentration field and apply business best practices to discuss, analyze, and propose actionable solutions. FIU operates fall, spring, and summer entry dates. First-time students (including transfer candidates with fewer than 60 credits) must submit ACT/SAT scores. They also need a minimum 2.4 GPA. Candidates with 75-90 transferable credits can opt for the dual-degree program, earning their bachelor's and master's degrees in hospitality in 3-4 years. Available Concentrations: Beverage management; culinary management; hotel/lodging management; restaurant/food service management; event management; travel and tourism management. Established in 1850, the University of Utah is the state's oldest higher education institution. Today, the school offers nearly 200 academic programs, including an online bachelor of science in parks, recreation, and tourism with an emphasis in sustainable tourism and hospitality management. In addition to providing technical and operational skills, the program teaches students to identify and assess the socio-cultural impact of tourism with respect to heritage conservation and biodiversity. Students can earn their baccalaureate credentials entirely online, taking asynchronous courses through Canvas. Alternatively, they may choose a hybrid learning experience by mixing in classes on the Salt Lake City campus. The curriculum totals 120 credits and includes required classes like leisure behavior and human diversity, hospitality law, and recreation programming and leadership. Students also take three classes in the emphasis area, learning how to implement digital marketing campaigns and manage protected lands. The degree plan contains electives in one of three focus areas, allowing learners to align their education to personal interests and career goals. Focus options include sustainable tourism management, hospitality management, and tourism enterprise and marketing. All students complete a senior internship to earn the accredited online hospitality management degree. The university provides spring, summer, and fall admission. First-time and transfer students with fewer than 30 credits must submit ACT or SAT scores. While the school does not establish a GPA minimum, successful undergraduate candidates typically boast a 3.39-3.89 GPA. Located in Tuscaloosa, the University of Alabama offers remote certificates and degrees in 11 fields of study, including an online bachelor of science in hospitality management that totals 120 credits. Through a comprehensive curriculum, students train to become assistant supervisors and managers in diverse industries, like convention sales, food services, and hotel and resort services. UA accepts applications year round. Students can complete all required coursework asynchronously through Blackboard. The degree plan contains 49 credits in classes like food preparation principles, hotel sales and event services, and hospitality information/computer systems. Students learn to manage production quality while maintaining financial solubility. This accredited online hospitality management degree also covers employee supervision and management. Students take 21 open elective credits, which they can use to pursue advanced topics or a complementary minor in areas like business administration and human resources. Learners may also use these electives to complete a designated concentration in either food and beverage management, hotel/lodging, or meetings and events. Degree candidates engage in a 500-hour internship. The program culminates with a senior seminar in which students discuss and research pertinent challenges in hospitality. First-time students need a minimum 2.5 GPA and must submit ACT or SAT scores. Students with 25 or more transferable credits with a minimum 2.0 GPA do not need to submit standardized test results. Distance learners enjoy a low tuition rate and ample financial aid opportunities, including the Back to Bama Grant and the College of Continuing Studies Scholarship. East Carolina University enrolls over 29,000 students every year, making it the fourth-largest university in North Carolina. The school offers 100 undergraduate degrees, including an online bachelor of science in hospitality management that prepares students for diverse careers like club managers, convention planners, and theme park directors. Degree candidates can earn their credentials entirely online through asynchronous coursework powered by Blackboard. Alternatively, they may create a hybrid learning experience by taking flexible classes on the Greenville campus. Totaling 126 credits, the degree plan consists of core classes in hospitality information systems, facilities management, and operational cost controls. Students also study various aspects of tourism, including its effects on local economies, native communities, and the environment. Unlike other hospitality management online degree programs, ECU embeds a business administration minor. Students take 24 credits of coursework on topics like project planning and human resource management, preparing for MBA programs. The curriculum offers concentrations in lodging management, food and beverage management, and convention and special events management. During their senior year, learners take a capstone seminar to discuss current challenges in the field, applying accumulated knowledge through research and presentations. Students also complete externships during their sophomore year and internships during their senior year. Candidates with a minimum 2.5 GPA can apply for admission in good standing. Prospective students with lower GPAs can seek enrollment by discussing their individual circumstances with an admission counselor. Distance learners pay tuition based on residency status. Based in Columbia, the University of South Carolina delivers 13 remote undergraduate programs through the Blackboard platform, including an online bachelor of science in hospitality management. The program operates a responsive curriculum that continually updates to include evolving business concepts and best practices. Students develop the technical and leadership skills needed to occupy management positions in food service, timeshare operations, resorts, lodging, and continuing care/retirement facilities. The 120-credit degree plan contains major requirements like hospitality financial management; hotel, restaurant, and travel law; and food service sanitation principles. Students also learn how to oversee large-scale food production with respect to pricing constraints and promotional strategies. Under the guidance of an academic adviser, students pursue three electives that support their academic and career goals. The degree culminates with an internship that enables candidates to engage in supervisory-level duties. The program encourages students to partner with businesses and organizations in South Carolina; however, learners can work with a local company with the approval of their faculty adviser and the department chair. USC operates spring, summer, and fall entry dates. As a completionist track, this accredited online hospitality management degree requires applicants to possess 45-60 transferable credits. Candidates also need a 2.0 minimum GPA. Most students earn their credentials in under two years. Distance learners enjoy affordable tuition rates that ignore residency status. Approximately 91% of USC students receive financial aid. The University of Massachusetts - Amherst offers four remote academic programs facilitated through the Isenberg School of Management, including an online bachelor of science in hospitality and tourism management. On top of a business foundation, the program trains students in strategic decision-making practices that consider sustainability, social responsibility, and the global economy. Graduates pursue lucrative careers in event planning, human resource management, hotel consultancy, and sales and marketing. The 120-credit degree plan consists of core classes like service experience management, hospitality and tourism law, and strategic planning in the hotel industry. Students also study restaurant operations, including menu creation, staff training, and food and wine vendor negotiations. The curriculum contains five guided electives, which degree candidates use to explore topics like professional ethics and real estate finance and investment. Students who earn the hospitality and tourism management degree online must complete practicums. They can partner with local businesses or one of the university's industry partners. Latter options include the Swiss Learn6/Work6 Program, in which students study at the prestigious Cesar Ritz Colleges. To enroll in this degree-completion program, candidates need at least 27 transferable credits. While the school does not publish GPA requirements, the typical undergraduate student holds a minimum 3.0 GPA. Application materials include official academic transcripts, a current resume/CV, and a 2-3-page personal essay. The University of Missouri - Columbia was established in 1839 as the first public postsecondary school west of the Mississippi River. Today, the institution offers more than 100 remote certificates and degrees, including an online bachelor of science in hospitality management. The program provides training in core business areas like financial planning and ethical leadership. Students also explore advanced hospitality topics, preparing them for careers managing sports venues, conference centers, university facilities, and restaurants. Totaling 120 credits, the accredited online hospitality management degree plan offers asynchronous classes powered by Canvas. Students do not need to visit campus unless they want to engage in optional summer practicums. Core classes include hospitality law, service management, and hospitality sales and marketing. Through 10 guided electives, distance learners pursue advanced topics in such areas as special events management and food service businesses. Degree candidates complete undergraduate training with an internship. They secure positions in their communities and apply hospitality management theories and concepts to solve real-world challenges. On top of field work, interns engage in curated projects that assess their analytical thinking skills. Mizzou operates fall, spring, and summer admissions. To enroll as first-time students, applicants must meet scaling GPA and standardized testing requirements. Transfer candidates need at least 25 credits earned with a minimum 2.5 GPA. Distance learners pay affordable tuition rates based on residency status. The school offers a 10% tuition discount to community college students, active military personnel, veterans, and eligible spouses and dependents. Approximately 75% of students receive financial aid. Based in Pullman, Washington State University operates 13 remote undergraduate programs through its Global Campus, including an online bachelor of arts in hospitality business management. Through an integrated curriculum, students develop expertise in fundamental business areas like event planning, operations, sales, and consulting. They also learn to lead interdisciplinary teams with respect to employee development and cross-cultural decision-making. Learners may earn their credentials entirely online by taking asynchronous coursework that spans either seven or 16 weeks. The 120-credit curriculum includes such required classes as collective bargaining, operational analysis, and hospitality leadership and organizational behavior. Students also learn to identify industry service gaps and propose solutions reflecting diverse stakeholder interests. The degree plan contains six credits of advanced business topics and 12 credits in coursework outside the major. To earn the hospitality business management degree, online students must fulfill an international experience requirement in one of five ways. Options include a six-credit study abroad trip, a foreign language major or minor, or the completion of WSU's global leadership certificate. Degree candidates may also fulfill this requirement through military service or volunteer positions with organizations like the Peace Corps and Americorps. Online students may enroll in spring, summer, or fall semesters. The university does not maintain GPA requirements; however, candidates with at least a 3.5 can apply for assured admission. Distance learners pay tuition based on enrollment and residency status. In addition to conventional financial aid, students can apply for programmatic scholarships beginning their sophomore year. Fort Hays State University delivers over 200 career-focused certificates and degrees through its Virtual College, including an online bachelor of science in tourism and hospitality management. The program prepares students for lucrative careers in the $1.3 trillion U.S. travel and tourism industry. Graduates occupy positions as event planners, cruise directors, and meeting and convention managers. The 120-credit degree plan includes required coursework in management information systems, tourism and hospitality marketing, and service and operations management. Students learn core leadership concepts that emphasize cross-cultural communications and intervention planning. They also study advanced topics in a concentration, such as events management, health and wellness tourism, and hospitality operations. The hospitality management online degree program includes an internship requirement. Learners may complete this hands-on training with a local company or participate in university-sponsored projects with industry leaders like Hyatt Hotels and Norwegian Cruise Lines. The internship totals 1,000 hours during which students must shadow a manager and occupy at least two positions. For first-time enrollment, FHSU requires a minimum 2.0 GPA from Kansas residents and 2.5 from all other students. Transfer candidates need 24 credits earned with at least a 2.0 GPA. All distance learners benefit from a low, per-credit tuition rate. The university offers financial aid, including merit scholarships based on standardized test scores. Students who graduated from an Iowa, Wyoming, Texas, or Arizona high school can apply for the Special Out-Of-State Scholarship. Northern Arizona University delivers 19 remote academic programs for business students, including an online bachelor of science in hotel and restaurant management. Accredited by the Accreditation Commission for Programs in Hospitality Administration, the program provides the expertise students need to enter any segment of the hospitality field. Graduates pursue careers as hotel managers, food and beverage directors, culinary trainers, and entrepreneurs. Students earning the hotel and hospitality management degree online complete 120 credits. In addition to a pre-major business core, required coursework includes hospitality leadership and ethics, facilities and sustainability management for hotels, and corporate finance. Learners also take two foreign language classes and five courses in a hospitality administration concentration. The remaining credits funnel into open electives, which degree candidates can use to craft a complementary minor. The curriculum contains a 1,200-hour internship requirement. Under the guidance of faculty mentors and industry professionals, students gain hands-on experience by working in hospitality establishments. The internship dovetails into a senior seminar during which learners synthesize organizational theory and strategic planning skills to solve simulated hospitality problems. NAU offers assured admission to candidates with a minimum 3.0 GPA and adequate SAT/ACT scores. Prospective students with a 2.5-2.9 GPA may apply for conditional admission. Transfer students must hold a minimum 2.0 GPA. The university delivers affordable per-credit tuition. Online students benefit from financial aid opportunities, including the Louie Transfer Award for nonresidents. Based in Livonia, MI, Madonna University offers 27 remote academic programs through Blackboard, including an online bachelor of science in hospitality and tourism management. On top of flexible coursework, the Madonna program provides networking and portfolio-building opportunities through internships and hands-on training. Students explore diverse career opportunities within hospitality, including hotel operations, campus housing, sustainable tourism, conference planning, and government convention bureaus. The curriculum totals 120 credits and includes major coursework in consumer behavior, merchandising for brand management, and hospitality architecture and interior design. Students gain the skills needed to manage retail stores, special events, hotels, and clubs. During their final two semesters, students complete an internship in their specialty. Degree candidates may complete this experience locally or through a university partner. The accredited online hospitality management degree culminates with a senior seminar. Students create an integrative framework that enables them to analyze the hospitality industry from economic, environmental, cultural, technological, and political perspectives. Through a managerial lense, learners identify and assess contemporary challenges facing hospitality professionals. Madonna prefers candidates with a minimum 2.75 GPA and scores of 20 on the ACT or 1,000 on the SAT. The university operates a generous transfer policy, allowing students to apply up to 90 credits toward degree completion. With transfer credits, learners may graduate in 1-2 years. Madonna supports online students through low tuition prices and financial aid, including scaling scholarships based on GPA. Established in 1907, Missouri State University is the second-largest higher education institution in the state, enrolling 24,000 students annually. The school delivers remote academic programming through Blackboard, including an online bachelor of applied science in hospitality leadership. Accredited by the Accreditation Commission for Programs in Hospitality Administration, the program combines asynchronous coursework with practical training in the form of paid internships. Students gain a comprehensive education that prepares them for management positions in hotels, restaurants, casinos, and catering businesses. The 120-credit degree plan includes classes like hospitality human resource management, banquet operations, and destination development. Distance learners also study legal compliance, exploring government regulations concerning employment, negligence, and contracts. Students expand their business framework by examining global trade policies and strategic management. To bolster this international dimension, candidates may spend 2-3 weeks studying abroad. Students earning the hospitality management degree online must complete a two-part capstone requirement. The internship portion totals 750 hours and exposes learners to three positions in their partner company. Students then reflect on their work history and the internship experience in an advanced leadership seminar, analyzing hospitality core principles and best practices to concretize a management philosophy. The degree-completion program requires candidates to possess an accredited associate of science or associate of applied science. Prospective students also need a minimum 2.0 GPA. The university provides affordable tuition prices and generous financial aid, such as the Hotel Nikko San Francisco Hospitality Leaders Scholarship. Founded in 1887 as a teacher training facility, Troy University still upholds a main campus in its namesake city in Alabama but has expanded to include additional locations in Dothan, Montgomery, and Phenix City, in addition to a robust online education system. Troy offers more than 260 undergraduate and graduate programs across five academic colleges, including 70 online degrees. Troy's BS in hospitality, sport, and tourism management encompasses prerequisite general education and core courses. Students must complete major core coursework in each of the concentration areas listed in the degree, and also choose a minor in areas such as event management, hospitality management, sport management, recreation, or tourism management. The 123-credit program culminates in a seminar course and internship. Students may choose to complete an additional practicum in their concentration area. Students who wish to earn the hospitality management degree online must hold a GPA of at least 2.0 and submit ACT or SAT scores of at least 20 or 1030, respectively, for unconditional admission. For conditional admission consideration, students must possess a GPA of at least 2.5 and ACT or SAT scores of at least 17 or 910, respectively. Students over the age of 25 do not need to submit test scores. Troy's online academic schedule follows nine-week terms, enabling students to apply at multiple start dates throughout the year. Students complete courses online through the Canvas learning management system. Support resources for distance learning include career services, online proctoring, and virtual tutoring options. A member of the California State University System for more than 60 years, Cal State East Bay encompasses campuses in Oakland, Hayward, Concord, and online. The university offers nearly 200 undergraduate and graduate degrees, minors, and certificate programs. Cal State East Bay also provides over 40 continuing education programs through evening, weekend, and online classes. As of 2018, 10% of Cal State East Bay students enrolled exclusively in online courses, and 57% of undergraduates enrolled in at least one online or hybrid course. Among its distance programs, the school offers a hospitality and tourism management degree online through its Hospitality, Recreation, and Tourism Department. This degree completion program includes coursework that explores finance, marketing, law, and leadership skills specific to the hospitality industry. Students complete an internship to conclude the degree. Online students can also to purse one of three optional concentrations in event planning and management; food and beverage; or lodging, resort, and club management. Students who do not choose a concentration take additional elective courses to meet the degree's credit requirements. Applicants must submit official transcripts for high school and previous college experience and SAT or ACT scores for admission consideration. Students with a GPA of at least 2.0 and a minimum of 60 completed semester units may apply to the BS in hospitality and tourism at Cal State East Bay. Cal State East Bay students complete courses through Blackboard. Distance learning programs follow a semester-based schedule, with each course lasting 15 weeks and providing asynchronous coursework. Resources for online learners include tutoring, advising, and career services. Opened in 1934 in Portales, ENMU represents both the youngest state university and the largest regional comprehensive college in New Mexico. The university today serves an enrollment of more than 6,000 through over 60 associate, bachelor's, and master's degrees, many of which are offered online. ENMU also operates satellite sites in Ruidoso and Roswell. ENMU's online bachelor of business administration degree features an emphasis in hospitality management. The 120-credit program includes business foundations, core courses, hospitality emphasis courses, and electives. Major coursework explores topics including hotel and club management, tourism development, and services marketing skills. Students must complete a course in international business and a capstone in business strategy and policy to conclude the degree. Applicants must submit transcripts and ACT or SAT scores. Students 25 years or older and transfer students with at least 30 transferable college credits may waive the test score requirement. ENMU charges tuition per semester for undergraduate programs using different rates for in-state and out-of-state learners. Students complete coursework in the hospitality business management degree online through Blackboard. Online courses span eight or 16 weeks, depending on the program and area of study. Among the many resources available to distance learners at ENMU, students can access virtual tutoring, test proctoring, disability services, and an advising center online. Established in 1891 in Menomonie, UW-Stout remains the only university in the Wisconsin state system named for its founder. One of only 125 polytechnic schools in the U.S., UW-Stout offers nearly 100 undergraduate and graduate programs on campus and online. Roughly 2,000 UW-Stout students enroll in online programs offered by the university each year. The school also supports the eStout Laptop Program, providing free laptops to new students. The BS in hotel, restaurant, and tourism management at UW-Stout incorporates the fundamental skills needed for aspiring managers in the industry to begin their careers. The bachelor's degree requires 40 credits of general education core courses, 68 credits of professional studies classes, and 12 credits of "professional selectives." The hotel and hospitality management degree online includes unique coursework, such as introduction to wines and spirits, principles of social media marketing management, and development of tourism attractions. Students must also complete a two-credit co-op or internship experience. Freshman applicants must submit their high school transcripts and SAT or ACT scores for admission consideration for the fall semester. Transfer students must supply high school and/or college transcripts and may apply for admission to either fall or spring term. UW-Stout classifies the online BS in hotel, restaurant, and tourism management as a "customized instruction program," charging a set per-credit tuition rate, regardless of students' residency status. Students can access the SmarterMeasure tool to assess their readiness for distance learning and complete courses through the D2L platform. UW-Stout maintains a multifaceted system of comprehensive resources for online learners, including online tutoring, virtual writing labs, and online library and bookstore access. Established in 1913, SUNY-Delhi's campus sits at the foot of the Catskills, just hours away from New York City. The school is home to more than 50 academic programs with an emphasis on applied learning and professional skills. One of the first of its kind in the nation, the bachelor of business administration in hotel and restaurant management degree at SUNY-Delhi combines coursework in operations, business, and leadership specific to management in the hotel and restaurant industries. Students explore topics including organizational communications, international business management, and public policy. The program includes an optional six-month internship opportunity at Walt Disney World in Orlando, Florida. Applicants must complete an associate degree or a minimum of 60 college credit hours with a cumulative GPA of at least 2.0 prior to admission. Prospective students must also complete introductory coursework online in financial accounting, hospitality management, and marketing before starting the core curriculum. The program includes prerequisites in liberal arts coursework, including classes in math, science, foreign language, and the arts and humanities. Students pursuing the hospitality management degree online complete courses asynchronously through the Moodle platform. New students may enroll in their choice of full- or part-time study online. SUNY-Delhi offers dozens of support resources for distance learners, including virtual tutoring, advising options, library and bookstore access, and online financial aid. Founded in 1962 in Hobbs, New Mexico, USW is a Christian-affiliated institution that offers a dozen online undergraduate degrees and 20 online graduate programs. USW's BBA in hospitality management emphasizes a strong foundation in broad business and contemporary skills relevant to the hospitality industry. The 120-credit program combines core, major, emphasis, and elective courses in topics including service marketing, food service management, and human resources. Core coursework encompasses prerequisites in religion, science, the humanities, and a servant leadership component. Transfer students must complete a minimum of 33 hours at USW, including the final 30 hours of the degree. Freshman applicants must possess at least two of the following criteria: graduating rank within the top 50% of their high school class, scores of at least 940 or 18 on the SAT or ACT, respectively, or a minimum 2.0 GPA. Transfer applicants should maintain a minimum 2.0 GPA and good standing at their prior college or university. Students may apply for admission to either fall or spring semester. Students complete online coursework through the Blackboard learning management system. USW prides itself on offering a variety of eLearning resources, including virtual tutoring options, an online writing lab, and an online new student orientation. Students may also access online registration and financial aid assistance and comprehensive tech support. With an enrollment of more than 6,000 students, SOU offers dozens of undergraduate and graduate degrees, preprofessional programs, and certificates. Students may choose to enroll at SOU's Ashland or Medford campus or online. Distance learners can complete their bachelor's degree, earn a master's degree in business or education, or pursue an enrollment/licensure program through the online division of SOU. SOU's hospitality management degree online encompasses 180 credits in foundations, non-business support, and upper- and lower-division business coursework. The online bachelor of applied science (BAS) with a track in hospitality and tourism explores concentrated coursework in marketing, operations, and financial management specific to the hospitality industry. Additionally, SOU’s curriculum includes upper-division integrated studies in technology, social responsibility and awareness, and diversity. Students complete a seminar course and participate in a practicum/capstone experience to conclude the degree. As a degree completion program, the online BAS requires applicants to satisfy general education prerequisites in communication, science, math, and humanities in order to enroll. Students must complete at least 60 credits, including the last 15 credits required to earn the degree, at SOU. Students complete online courses in the Moodle platform. SOU distance learners can access library services, disability services support, and mobile apps exclusive to SOU, such as "SOU 2 Go." Online students pay the same tuition rates as on-campus students, plus a small per-credit online delivery fee for distance learning. Established more than 100 years ago in Durham, NCCU maintains a campus in the heart of the Research Triangle, underscoring its reputation as a leading national research institution. The university hosts an enrollment of more than 8,200 students and offers more than 80 degrees for undergraduate and graduate students. Business administration ranks among the top three most popular majors at NCCU. The 128-credit online BS in hospitality and tourism encompasses major, business major, and general education requirements. The curriculum explores topics including introduction to travel and tourism, lodging management and operations, and hospitality sales and marketing. Students must complete a hospitality and tourism seminar and internship totaling 1,000 hours to earn the degree. The program includes general education requirements in areas including communications, global awareness, professional development, and critical and analytical thinking. To apply, students must submit a high school diploma or GED, SAT or ACT test scores, and evidence of leadership and/or service experience in their community or within academia. NCCU accepts applications on an ongoing basis. Students complete coursework in the hospitality business management degree online through Blackboard. NCCU charges variable tuition rates per credit for online undergraduate study, depending on the student’s residency status. Online student support resources include Upswing tutoring options, library access, disability services, veterans centers, and counseling services. With a campus near Myrtle Beach in Conway, South Carolina, CCU serves a diverse student enrollment of more than 10,600. Roughly half of the student population at CCU resides in South Carolina. The university offers more than 100 bachelor's, master's, and doctoral degrees across as many unique fields of study, emphasizing business and coastal and marine science programs. CCU offers its hotel and hospitality management degree online through the E. Craig Wall Sr. College of Business Administration. The 120-credit program encompasses core, foundation, business core, major, and elective courses. Major coursework explores guest services, quality process management, and food service management. Students must complete a resort management internship and a seminar course in resort tourism planning to conclude the degree. Students pursuing the bachelor's in hospitality, resort, and tourism management must also fulfill prerequisites in business communication, business ethics, and calculus. CCU accepts applications on a rolling basis. Applicants must submit transcripts of all prior coursework and SAT or ACT scores for admission consideration. Online students complete coursework in Moodle and can access support resources through the Moodle mobile app. CCU offers a wealth of distance learning resources, including counseling and tutoring options, career services, and assistance for veterans and students with disabilities. Coursework may require occasional synchronous meetings but does not require students to visit the CCU campus at any time. With multiple locations across the state of Florida, Everglades University occupies a main campus in Boca Raton, and additional sites in Miami, Orlando, Sarasota, and Tampa. The university offers more than a dozen degrees in as many academic disciplines, all available either online or on campus. EU ranks among the best regional universities in the South, according to U.S. News & World Report. Students earning the hospitality management degree online take 123 credits in general education, upper- and lower-division core, and interdisciplinary studies courses. Coursework explores topics including principles of hospitality, fundamentals of the service industry, business ethics, and operations management. EU awards credit for prior learning, especially for hospitality management majors with academic experience in finance, business administration, construction, or management. The BS in hospitality management culminates in a capstone course. Most students can complete the online bachelor's degree in 41 months, though students may complete the degree sooner with transfer credits. Generally, applicants must submit a high school diploma or college transcripts and SAT or ACT scores to apply. Students complete coursework online through Blackboard. The school also offers a Blackboard mobile app for quick access to online course information.The university offers online support to distance learners through resources including tech support, an online library and writing lab, and Smarthinking academic tutoring. Opened in 1921 as the Pittsburgh School of Accountancy, RMU eventually took the name of the prominent Founding Father, Robert Morris. The school is located less than 20 miles from downtown Pittsburgh, offering more than 80 undergraduate and graduate programs on campus and online. With an emphasis on professional programs and training, RMU boasts a rate of 77% of graduates working in a professional or management position. RMU's online bachelor of science in business administration (BSBA) with a concentration in hospitality management encompasses core, major, and elective credits and typically takes students four years to complete. Students may also pursue an accelerated dual-degree option through the university's 4+1 integrated degree program, earning an MBA in addition to the BSBA with one additional year of study. Offered through the School of Business, the hospitality management degree combines general business skills with sales, management, and operations coursework specific to this industry. RMU’s hospitality management program culminates in a strategic management course. Applicants must submit a high school diploma or GED equivalent and SAT or ACT scores. RMU shows preference to applicants with a minimum 3.0 GPA and SAT or ACT scores of 1080 or 22, respectively. Transfer applicants with a minimum of 30 credits must submit college transcripts; students with less than 30 completed credits should submit high school transcripts instead. Students complete courses online through the Blackboard learning management system. RMU offers distance learning resources, including around-the-clock tech support and personal advisers for financial aid, career services, counseling, and student wellness. RMU charges a online learners a flat, per-credit tuition rate, regardless of the student's state of residence. Part of the University of South Carolina System, Palmetto College offers two-year associate programs on its campuses in Lancaster, Sumter, Salkehatchie, Union, and Fort Jackson, in addition to more than a dozen online degree-completion bachelor's programs. UofSC also offers students the opportunity to complete prerequisites in liberal arts and general education through its Carolina Core program. The accredited online hospitality management degree offered by Palmetto College at UofSC consists of 120 credit hours, designed for students with at least 45 previously completed college credits. The degree is hosted by the UofSC Beaufort campus and students can transfer directly into the on-campus program at any time. Students explore major coursework topics including hotel, restaurant, and travel law; club management; and hospitality-based financial management and marketing strategies and practices. Learners earning the BS in hospitality management must also complete a 400-hour hospitality management internship. UofSC charges variable tuition rates based on a student's enrollment and residency status. Students may start the program during the fall, spring, or summer term. Generally, all applicants to UofSC's degree-completion programs through Palmetto College should complete two years of college study, or 45-60 credits, and submit college transcripts to apply. Students complete online courses through the Blackboard platform. Distance learners can access a variety of academic and holistic resources through the Student Gateway, including comprehensive career services, financial aid, tutoring, and tech support. The service desk at the school's Division of Information Technology maintains a self-service portal, an online database, and phone and chat options for assistance during office hours. Founded in 1964 under the South Carolina Baptist Convention, CSU today maintains a scenic 300-acre campus in Charleston. The university serves a student enrollment of nearly 3,500, offering more than 80 undergraduate, graduate, doctoral, and online programs. CSU ranks among the nation's best online bachelor's degree programs, according to U.S. News & World Report. CSU offers a BS in hospitality and tourism through Charleston Southern Online. The program encompasses a combination of liberal arts core and major studies coursework totaling 125 credit hours. Students explore topics including fundamentals of planning and developing tourism, international business, and introduction to hospitality industry. The program requires all students to complete a course entitled "student success and Christian worldview in online studies." Students must also satisfy prerequisites, including foreign language, math, and liberal arts courses, to earn the hospitality management degree online. Freshman applicants must submit high school transcripts and SAT or ACT scores. Students with at least 24 transferable credits may apply as transfer prospects, provided the credits were earned with a GPA of at least 2.0 and include core math and English courses. The online BS in hospitality and tourism management offers a set tuition rate per credit regardless of the student's state of residence. Distance learners complete courses online in the Blackboard learning management system. Students can access the same support services as on-campus learners through the student portal, including the campus ministry, counseling, career services, technology assistance, and financial aid. Earning a bachelor's degree through a hospitality management online program provides learners who seek to work in the hospitality industry with the best possible foot forward. By earning this degree, learners gain the skills they'll need to land employment in a wide range of positions throughout the sector. As with many fields, programs differ from school to school. Online hospitality courses can include an emphasis in hospitality or tourism management, or a specialization in certain fields such as club management, restaurant management, or casino management, to name a few. Online hospitality courses may differ by program and by school. Below are a few examples of courses learners can expect to encounter while pursuing a hospitality management degree online. Introduction to Hospitality Business Management: This course provides learners with a preliminary overview of the hospitality industry before students decide what concentration they would like to pursue. Introduction to Beverage Management: As its title implies, Introduction to Beverage Management focuses on the administrative side of the beverage industry. The course provides students with an overview of the history, trends, opportunities, logistics, and legal/regulatory aspects associated with the production of both nonalcoholic and alcoholic beverages. Introduction to Event Planning: Introduction to Event Planning is useful course for students majoring in business and learners pursuing an online hospitality management degree. The course also provides an overview of the event planning industry, including examinations of sector components, interrelationships, economics, and theory. Gaming Management: Gaming Management is a more specialized online hospitality course. The course is designed to provide students with an overview of the workings of a typical commercial casino/hotel environment. Gaming Management examines the history of legalized gambling, casino types, organizational structures, table games, financial flow, operational analysis, casino marketing, and regulatory environments, among other topics. How Long Does it Take to Get a Bachelor's in Hospitality Management Degree Online? Like other factors, the length of a bachelor's degree in hospitality management online program depends on the school a student chooses. On average, most hospitality degree online programs require 120 credit hours to complete. Major requirements vary by school, but often include online hospitality courses designed to provide an introduction to hospitality management, food service, beverage management, restaurant management, hospitality law classes, and financial analysis. Most course schedules are flexible and students can generally complete courses entirely online with no campus visit required. Some programs pair students with a success coach. Due to the flexible nature of most online programs focused on the field, students more often work at an individual pace as opposed to cohort learning. Time required to complete a bachelor's degree in hospitality management online program varies from institution to institution. Projected completion times can be influenced by requirements involving field work experience or internships. Some programs also require applicants to have accrued a certain number of hours of work experience before program acceptance or graduation. Most bachelor's degree in hospitality management online programs are regionally accredited. When a school is regionally accredited, it means that the school is accredited by one of six major regional accrediting bodies in the United States. Regional accreditation is typical — it's the most widely recognized type of college accreditation. Nationally accredited schools typically focus more on vocational and trade schools that offer certificates or degrees. When choosing an online school, look for one of the following regional accreditations: MSA (Middle States Association of Colleges and Schools), NEASC (New England Association of Schools and Colleges), NCA (North Central Association of Colleges and Schools), NAC (Northwest Accreditation Commission), SACS (Southern Association of Colleges and Schools), or WASC (Western Association of Schools and Colleges). More specialized, program-specific agencies such as the ACPHA (Accreditation Commission for Programs in Hospitality Administration) also provide accreditation. There are two main agencies responsible for accreditation, the U.S. Department of Education and the Council for Higher Education Accreditation. The U.S. Department of Education, an agency of the federal government, establishes policy, and administers and coordinates most federal assistance to education. The largest institutional higher education membership organization in the United States, the Council for Higher Education Accreditation promotes academic quality and is an authoritative source of information and data about regional, career-related, faith-related, and programmatic accreditors. Future students need to know which programs to pursue when planning for their career. To find schools that are properly accredited and offer the online hospitality degree programs you are interested in, please visit the DOE's website or the CHEA's website. According to a 2014 survey by Georgetown University's Center on Education and the Workforce (CEW), job placement rates for hospitality management degree-holders have improved in recent years. In 2009-10, the unemployment rate for hospitality management bachelor's degree-holders with work experience was 5.7%, while inexperienced bachelor's graduates faced a 9.1% unemployment rate. Two years later, these figures had fallen to 4.5% and 5.2%, respectively. Using data from the CEW survey, the following table compares unemployment rates for hospitality management majors against students who earn undergraduate degrees in other business-related disciplines. As the table demonstrates, the unemployment rate for experienced graduates with a bachelor's in hospitality management is comparable to the unemployment rate for other experienced business majors. However, inexperienced hospitality management degree-holders may have a tougher time finding work than graduates from other fields. The earning potential for hospitality management degree-holders is increasing as well. According to the CEW survey, hospitality management majors with work experience earned a median annual salary of $59,000 in 2012, while inexperienced college graduates in the field earned $34,000. PayScale also reports that graduates with a bachelor’s in hospitality management outearned their associate-holding counterparts by a considerable margin. The table below compares the salaries for hospitality management graduates with bachelor’s and associate degrees. As the table indicates, entry-level professionals with a bachelor’s in hospitality management outearned associate-holders by a little more than 8%. It’s important to note, however, that salaries in hospitality vary significantly depending on your experience, location, job title, and a number of other factors. The following table uses PayScale data to explore what professionals in the field earn throughout their career in a variety of positions. Of the five careers listed on the table, hotel general managers see the highest career salary growth ― around 83% between the entry-level and late-career stages. Marketing managers placed second with 46% growth after 20 years in the workforce. Students who graduate with a bachelor's degree in hospitality management will qualify for dozens of entry and mid-level jobs, as well as managerial positions typically reserved for candidates who have a college education. Below, we've covered four of the most common career pathways for professionals with a hospitality management degree. Destination Marketing Managers: Like marketing managers in other industries, these professionals strive to generate a positive image for their organization ― in this case, usually tourist destinations and accommodations. They launch promotional campaigns online and through social media, and write press releases about notable upcoming events. Lodging Managers: These managers oversee the day-to-day operations at hotels, resorts, spas, and other tourist retreats. Managing these establishments requires extensive knowledge of finance, logistics, supply chain and human resources, and customer service. Food Service Managers: Food service managers oversee operations at restaurants, bars, and other establishments that serve food and drinks. Some may work in food delivery or catering, as well. This job requires a vast knowledge of food safety and preparation techniques, along with a background in logistics, communication, and human resources. Meeting, Convention and Event Planners: These professionals are responsible for coordinating conferences, business retreats, corporate gatherings, wedding receptions, and other private parties. These planners oversee every logistical detail, from food and drink service to decorations and music, and they may also manage accommodations for overnight events. Many bachelor's-holders choose to continue their education in an MBA program. For more information on this option, take a look at our Online MBA Guide. Making professional connections and learning about different approaches to hospitality management is crucial to your success. Professional organizations offer a great entry point for students who want to learn more about their chosen career path. Below you'll find three of the country's most prominent organizations established for hospitality professionals. These organizations host networking events, provide online trainings, maintain active job boards, and offer other services for career-ready college graduates. American Hotel and Lodging Association: The AHLA is the largest professional organization for professionals in the U.S. lodging industry. Currently, the association represents 1.9 million employees and 53,000 properties worth $176 billion in annual sales. National Restaurant Association: Accounting for more than 500,000 businesses, the National Restaurant Association is the world's largest food service professional organization. Member benefits include discounts on business solutions, management software platforms, menu consultation, and other valuable tools and services. World Travel & Tourism Council: The WTTC was founded in 1991, and currently represents more than a quarter-million hospitality industry jobs. The council's website features an extensive collection of economic and policy-related resources, along with a multimedia center and a blog.